All the elements of glamour come together in this ring to create an attractive art deco design. Apples of Gold hits the mark with this two-tone yellow and white gold ring. 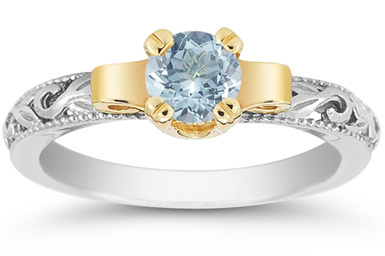 It features a scintillating aquamarine stone that boasts both brilliance and elegance. The gemstone is set in a warming yellow gold which provides a naturally beautiful contrast. The white gold band is carved with swirls and edged with two thin, beaded lines, making this art deco piece an inspiration in itself. 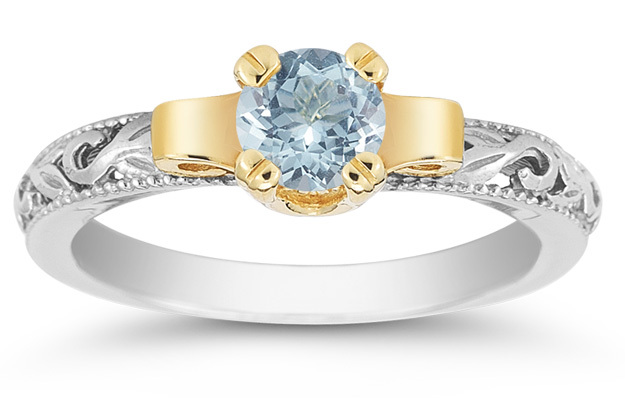 We guarantee our Art Deco Aquamarine Engagament Ring, 1/2 Carat to be high quality, authentic jewelry, as described above.